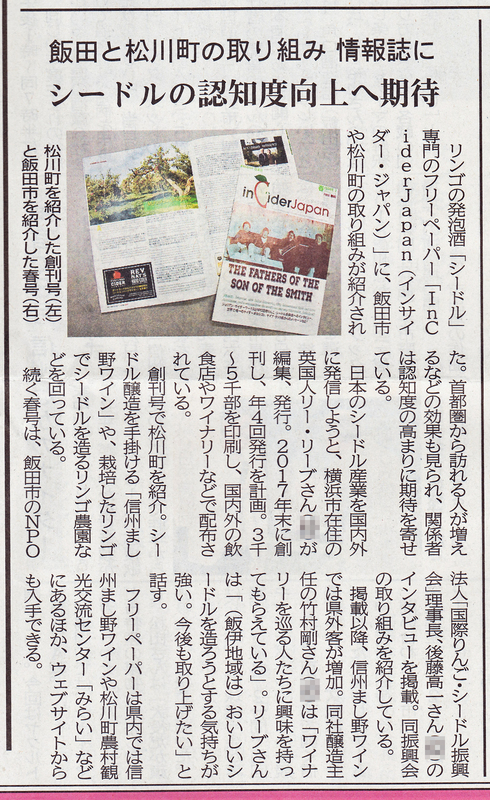 inCiderJapan appeared in a short article by the Shinano Mainichi Daily Newspaper on June 9, 2018. It is our first appearance in any Japanese media, and we are proud to be quoted as having helped the city of Matsukawa’s tourism since featuring an article about them in our premier issue. inCiderJapan will continue to write about and promote Japan’s cider industry to the best of our ability. We look forward to publishing more stories about the many places in Japan where cider is playing a bigger part in the daily lives of its people. We would especially like to thank Nagano Prefecture and its communities for their ongoing collaboration with inCiderJapan to make this possible. Finally, we look forward to returning to Matsukawa to follow up on its growth and progress!